Restroom Remodels Company LLC is a leader in the commercial restroom industry. We provide partitions hand dryers plumbing and accessories nationally. Our "Bathroom in a Box" program: All of your bathroom equipment shows up at one place at one time. Saving you time: We provide one contact and one invoice for everything. We make sure everything is delivered the day you need it there. 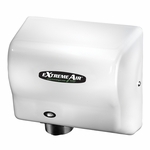 Saving you energy: We supply many different energy saving hand dryers and offer great pricing on all. Saving you money: We offer great pricing on everything from grab bars to partitions. All you need to do to start saving is reply with your restroom specs. You can email or fax them to 617 845 0350. We will reply with our quote. It is that easy. In many cases we can ship hand dryers the same day. Partitions have a lead time of 1-5 weeks depending on material and size. Full refunds minus shipping on all hand dryers and accessories. Item must be unopened.